Jody Wilson-Raybould told the Commons today she wants to tell her side of the SNC-Lavalin scandal now consuming official Ottawa, but she can't "waive" solicitor-client privilege on her own. Former justice minister says solicitor-client privilege is not hers "to waive"
Jody Wilson-Raybould told the House of Commons today she wants to tell her side of the SNC-Lavalin scandal now consuming official Ottawa, but she can't "waive" solicitor-client privilege on her own. The former justice minister and attorney general rose to explain why she was abstaining from a vote on an NDP motion to hold a public inquiry into alleged political interference in the criminal prosecution of the Quebec-based global engineering firm. Wilson-Raybould said she would refrain from voting because she was personally involved in the matter. "I understand fully that Canadians want to know the truth and want transparency," she said. "Privilege and confidentiality are not mine to waive, and I hope that I have the opportunity to speak my truth." Wilson-Raybould has stayed silent on the allegation — first reported by the Globe and Mail — that she was pressured by figures in the PMO to direct the Public Prosecution Service of Canada to draft a deferred prosecution agreement (DPA) (a legal tool resembling a plea deal) for SNC-Lavalin. That would have allowed the global engineering firm to avoid criminal prosecution on bribery and fraud charges related to contracts in Libya. 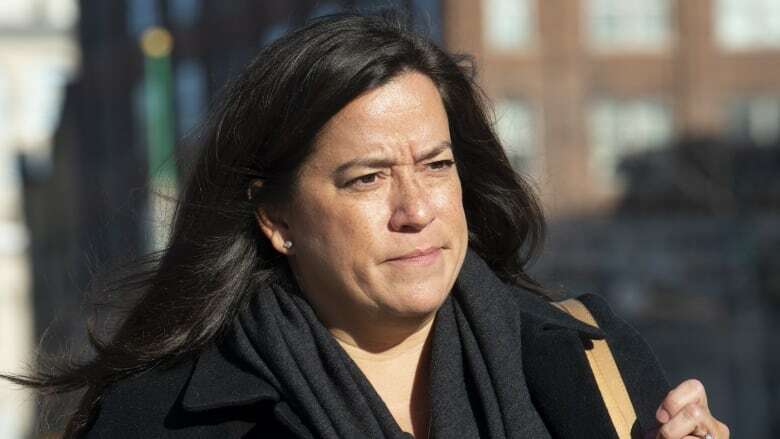 Wilson-Raybould has said she remains bound by client-solicitor privilege and cannot comment; as the former attorney general, she served as the government's top lawyer. Wilson-Raybould quit Trudeau's cabinet last week — just a week after Trudeau demoted her to the Veterans Affairs portfolio and just days after the Globe and Mail report. Wilson-Raybould's surprise abstention from the vote on the NDP motion came just hours after she reassured the Liberal caucus that she was fully on the team. Multiple caucus sources told CBC News that when Wilson-Raybould spoke in a caucus meeting today, she said she fully supported the Liberal agenda — especially on Indigenous issues. She did not discuss the specific allegation that she was pressured to intervene in SNC-Lavalin's case, but repeated her line that she was seeking legal advice on what she's permitted to say. Several MPs told CBC News that her presence at the caucus meeting and the team-focused message she delivered there was taken by Liberals as a good sign — though they expressed concern about their inability to predict what Wilson-Raybould might do or say next. Multiple MPs told CBC News the theme of the caucus meeting was largely a call for unity after a very rough few weeks for the Trudeau government. They said dozens of MPs went to the microphone to say that they are a team and need to pull together. Many also urged their colleagues not to speak to the media, warning that it could undermine the government. Prime Minister Justin Trudeau conceded to his MPs at the caucus meeting that he has not handled this controversy as well as he could have, and apologized for the fact that they've been left in the dark by the fast-moving controversy, according to Liberal MPs who spoke to CBC News on condition they not be named. Those MPs said that caucus chair Francis Scarpaleggia asked all staff — even those from the Prime Minister's Office — to exit the meeting, leaving only MPs in the room. The NDP's motion would have launched a public inquiry into the allegations and called on the government to waive client-solicitor privilege in the SNC-Lavalin affair. Conservatives supported the motion. It was defeated by the Liberal majority in a 134-160 vote. Two Liberal MPs, Nathaniel Erskine-Smith and Wayne Long, broke ranks and voted with the opposition. Trudeau has asked Justice Minister and Attorney General David Lametti to review the matter of solicitor-client privilege in this case. Wilson-Raybould has retained retired Supreme Court justice Thomas Cromwell to advise her on what she can and can't say. Earlier today, Trudeau apologized to Wilson-Raybould today for what he called "absolutely unacceptable" comments and cartoons about the former justice minister linked to the swelling scandal. "I wasn't quick enough to condemn, in unequivocal terms, the comments and commentary and cartoons about her last week," Trudeau told reporters before facing another bruising round of questions about SNC-Lavalin in the Commons. "They were absolutely unacceptable and I should have done it sooner." Trudeau didn't specify which comments inspired his apology. Recently, the Canadian Press ran a story quoting anonymous sources who described Wilson-Raybould as someone who had "become a thorn in the side of the cabinet" before she was shuffled to Veterans Affairs last month. She was also described as "someone ... [who] was difficult to get along with, known to berate fellow cabinet ministers openly at the table, and who others felt they had trouble trusting." Several political cartoonists taking off on the SNC-Lavalin scandal portrayed Wilson-Raybould bound, gagged and beaten — a reference to Wilson-Raybould refusing to comment on the scandal publicly because of solicitor-client privilege. Earlier today, Trudeau suggested a public inquiry isn't necessary to get to the bottom of the SNC-Lavalin affair. Heading into the caucus meeting, he did not rule out an inquiry but said the Commons justice committee is "seized" with the issue and noted the ethics commissioner also has launched an investigation. "We'll be hearing from (Wilson-Raybould), we'll be hearing from experts, we'll be hearing from a range of people. (The committee) will make the determination as to who it needs to hear from," he said. "It is important that there be an airing on this situation at the same time as we continue to work on a broad range of big issues that matter." Scarpaleggia said he has "a lot of faith" in the justice committee process and doesn't think a public inquiry is necessary. "Personally, I don't see a need for one," he said. MPs left the caucus meeting with little to say publicly about the mood in the room. Public Safety Minister Ralph Goodale said the investigations by the justice committee and the ethics commissioner will unfold in a "careful, logical and orderly fashion." After a two-hour closed door meeting Tuesday, members of the justice committee emerged with a list of witnesses that includes a handful of academics and Lametti, in addition to Wilson-Raybould. The hearings were tentatively scheduled to begin this afternoon, but were delayed due to scheduling issues with potential witnesses. On Thursday, Lametti is scheduled to testify, as is Nathalie Drouin, deputy minister of justice and deputy attorney general, and Michael Wernick, clerk of the Privy Council and secretary to the cabinet. Wilson-Raybould is not expected to appear before the committee until next week. Today, she said she respects the committee process. She also acknowledged that the question of whether her appearance will be meaningful — given the potential limitations on what she can say — is "an appropriate one." "I want to be able to ensure that I'm confident in what I can and can't say," she said on her way in to the weekly Liberal caucus meeting. "I know this is frustrating for many people. I'm committed to ensuring that I know what I can and cannot say as I'm getting legal advice around privilege." Conservatives and New Democrats have accused the Liberals of blocking key players from appearing before the justice committee — among them Gerry Butts, who suddenly resigned Monday from his position as Trudeau's top adviser. Wilson-Raybould surprised many Tuesday when she emerged from the cabinet room in the afternoon after addressing Trudeau and his ministers. Today, Trudeau said she had asked to address her former cabinet colleagues. "I think it's extremely important that everyone have an opportunity to hear the different perspectives in this situation," he said. After Wilson-Raybould abstained from today's vote, the Conservatives and NDP said Trudeau and Lametti also should have abstained because they are directly involved in the matter. House Speaker Geoff Regan did not immediately rule on the matter, instead taking time to review precedent. Green Party Leader Elizabeth May said it was not improper for Trudeau to vote, noting that in the Westminster parliamentary system the "client" is the government, not the individual prime minister.